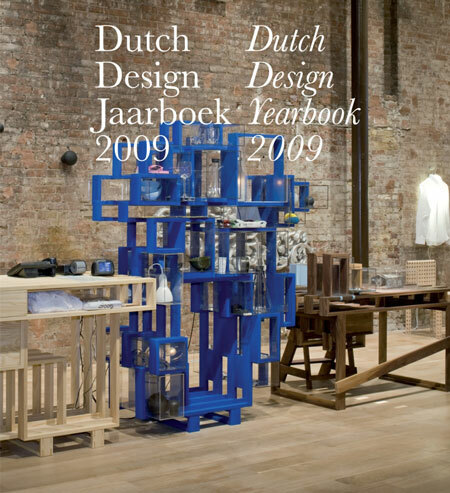 Dezeen and the organisers of the Dutch Design Awards (DDA) have got together to offer readers the chance to win one of five copies of the Dutch Design Yearbook 2009. Edited by DDA selection committee chairs Vincent van Baar, Bert van Meggelen and Timo de Rijk, the book features 60 projects produced in the Netherlands between 2008 and 2009 in the fields of spatial design, product design, fashion and graphic design. This first official yearbook, designed by Studio Dumbar, includes work by Maarten Baas, Studio Libertiny, UNStudio, Marcel Wanders, Bureau Ira Koers, Pieke Bergmans and many others. Five winners will be selected at random and notified by email. Dezeen competitions are international and entries are accepted from readers in any country. Winners’ names will be published in a future edition of our Dezeenmail newsletter and at the bottom of this page. Produced with the support of the Mondriaan Foundation Amsterdam and the Prince Bernhard Cultural Fund This first Dutch Design Yearbook presents a survey of more than 60 of the best designs in the field of spatial design, product design, fashion and graphic design that were produced in 2008-2009 in the Netherlands. A selection of important events, publications and exhibitions in the field adds colour to the design year and content to the design debate during this period. ‘Dutch Design’ – whether design pur sang, fashion design, graphic design or architecture – has over recent years been winning acclaim the world over. Besides being of interest to designers, studios and the industry, this publication is also highly accessible to a broad international readership with an interest in Dutch design. With designs by, among others, Maarten Baas, Irma Boom, Pieke Bergmans Doepel Strijkers Architects, HUNK-design & ID-Eddy, Iris van Herpen, Juurlink [+] Geluk, Bureau Ira Koers, Klavers van Engelen, Ted Noten, Momkai, Observatorium, Thonik, Daan Roosegaarde, Ingrid Siliakus, Wieki Somers, Studio Libertiny, Rieks Swarte, UNStudio, Richard Vijgen, Thomas Kopperschlaeger, Marcel Wanders and West 8. This bilingual publication was conceived as a follow-on to the successful formula of the Yearbook Architecture in the Netherlands, whereby an expert, independent editorial team select designs to be included, and provide compelling reasons for doing so. With this new yearbook on Dutch Design, NAi Publishers aims to showcase the field broader than ever before by going more deeply into content, providing hierarchy and depth to choices, focusing on design policy in the Netherlands and highlighting the social context in which design takes place. Thanks to collaboration with the Dutch Design Awards organization (DDA), it has been possible to make an essentially authoritative yearbook drawing on the expertise of a large group of specialists. The DDA selection committees with experts representing every field of Dutch design were chaired by Timo de Rijk (product design); Bert van Meggelen (spatial design) and Vincent van Baar (communications/graphic design). They are also the editors of the Dutch Design Yearbook. Dutch Design Awards are the prestigious awards for the very best Dutch Design available. The annual event comprises the competition, an international traveling exhibition, and the production of the Dutch Design Yearbook 2009. These activities ensure a platform for the presentation and recognition of the very best of Dutch design - across the full width of the design field. Congratulations to the winners! Ζouglos Vagelis in Greece, Danker Lorimer in the UK, Emile LeJeune from the US, Bonny van Sighem in the Netherlands and Maite Zabaleta Nerecan in Spain.